Compromised, foreign-funded propagandists shame, undermine, and endanger real academia. The May 22, 2014 Thai military coup that ousted the regime of convicted criminal, fugitive, accused mass murderer billionaire Thaksin Shinawatra has "shaken the tree," dislodging and exposing many aspects of his deep network of foreign-funded subversion laid down over the years to aid in his efforts to undermine and upturn Thailand's traditional institutions and political order. Image: Pinkaew Laungaramsri openly praises Thaksin Shinawatra's "red shirts" and even participates in protests organized by Thaksin Shinawatra's political machine. 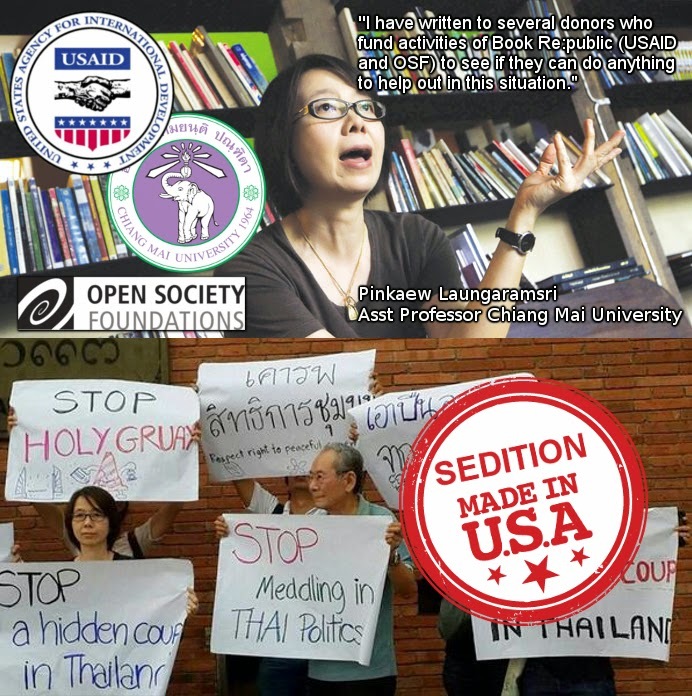 Funded by USAID and Open Society, she has now contacted both sponsors in attempts to lobby for "pressure" to be put on the military after ousting Shinawatra from power and cracking down on his subversive networks of which she is a component. The "Stop Holy Gruay" gimmick in the picture above is in reference to a "red shirt" meme publicized on Shinawatra's protest stage itself. Among these include a massive, heavily armed terrorist wing that had positioned weapon caches across the country for a planned "civil war." Another network includes a foreign-funded network of faux-academics, hiding behind their titles, credentials, and professorships to peddle pro-Thaksin, pro-globalization propaganda aimed at undermining Thailand's indigenous institutions and replacing them with foreign, corporate-financier funded NGOs. The Human Rights Lawyers Association, Cross Cultural Foundation, Union of Civil Liberties and the Enlawthai Foundation have also called for the return to a civilian democratic regime and for the military to go back to the barracks. This is an almost verbatim repeat of the US State Department's official statement condemning the coup and demanding immediate elections that would once again return Shinawatra to power and illustrates the role these NGOs serve - an echo chamber that translates US State Department talking points into the local language of choice - in this case Thai. Prachatai alone receives millions of baht in foreign funding a year, a fact made known only as recently as 2011 after calls for transparency eventually resulted in a partial disclosure. Prachatai's funding was made available only up to and including the 2011-2012 fiscal year, and only in English. Prachatai's Thai readers to this day are asked for donations without knowing the organization is funded millions of baht a year, while English readers are left in the dark regarding Prachatai's current funding. The National Endowment for Democracy's official website still lists Prachatai as a current recipient of funding. Keeping this in mind is essential in understanding the role these fraudulent, opaque NGOs play as an interface between foreign interests and Thailand's growing faux, foreign-funded academic community. Beginning in northern Thailand, the alleged epicenter of Thaksin Shinawatra's political influence, home to hismurderous "Rak Chiang Mai 51" "red shirt" street mob, is Chiang Mai University (CMU). CMU, like all of Thailand's academic institutions, indeed hosts a wide variety of skilled, professional, and truly academic scholars. But as Shianwatra's network of subversion rotted Thailand inside and out, the university found itself the unfortunate host for those like assistant professor Pinkaew Laungaramsri. Pinkaew regularly "studies" Shinawatra's "red shirt" movement and goes on at length during "seminars" expounding the merits of their "pro-democracy" agenda. She would even stop at one point during a seminar to explain how she in particular, personally liked a "red shirt" because he at one point had been a supporter of Thailand's revered monarchy but had since switched sides. Her inability to remain impartial, professional, or in anyway academic through her poorly disguised political agenda is not her only conflict of interest. She maintains what she calls a "bookstore" that is funded by USAID and convicted financial criminal George Soros' Open Society Foundation. A bookstore - being an establishment that generally makes money by selling books - that is funded by not one, but two foreign government organizations, raises suspicions that her bookstore, "Book Re:public" is in fact a front. I have written to several donors who fund activities of Book Re:public (USAID and OSF) to see if they can do anything to help out in this situation. Although it might not have much impact since the military seems to don't care to listen to anyone, we still hope that international pressure would at least help make it difficult for the military junta to continue their aggressive treatment towards people. By "people," Pinkaew means those aiding and abetting Shinawatra. After supporting Shinawatra and his network, even participating in "red shirt" protests against the coup, Pinkaew went on to call for foreign governments to "pressure" the military - and she did so by contacting the foreign institutions that kept her activities in business. Calling on foreign governments to "pressure" your nation is by definition treason. Pinkaew's doing so in defense of the ousted regime of Thaksin Shinawatra is all the more troublesome - since she poses as an advocate of "democracy" and "human rights" when under Shinawatra neither existed. Thammasat is one of Thailand's premier universities. Its alumni can be seen making a positive impact in Thai society across a wide range of fields. However, a recent organization calling itself "Nitirat" or the "Enlightened Jurists" have tainted Thammasat's reputation and have turned the university into a spectacle of transparent, politically motivated lobbying dressed as "academia." While the organizations claims to be impartial, apolitical, aimed at defending "democracy" and fighting what it calls "draconian Lese Majeste" laws, during one of its first meetings the auditorium was filled literally with Thaksin Shinawatra's red shirts. And in the front row, Thaksin Shinawatra's paid-corporate lobbyist, Robert Amsterdam of Amsterdam & Partners, sat, overseeing the proceedings. Far from an actual academic seminar, it was instead an attempt to re-brand Shinawatra's "red shirt" movement, perceived even abroad as uneducated, prone to violence, and more of a cult of personality built around the Shinawatra family than a "pro-democracy" movement. Nitirat was supposed to put a "liberal" and "progressive" spin on the movement, but failed. It was a transparent example of "academica" being used to dress up what was essentially one of Shinawatra's crass and exploitative "red shirt" rallies, only held indoors, and with a drawling law lecture in place where Shinawatra's typical program of free food and country music would normally be. While many Thais suspected Nitirat was aligned with Shinawatra, they could never have imagined the scope of conflicting interests Nitirat was actually engaged in. Sawatree Suksri, a law lecturer from Thammasat University, and a member of "Nitirat" was recently detained by the Thai military after returning from the US after what she admits was a US Embassy "study trip" on "human rights." Her supporters, including Kan Yuenyong, founder and director of Siam Intelligence Unit, claim she was in fact on a US State Department-funded exchange program. Sawatree also contributed to the 2013 Freedom House report - the report being leveraged yearly to undermine political order around the world the West would seek to topple and replace with client regimes. This is perhaps the most troubling conflict of interest Sawatree is involved in. Not only did she have Thaksin Shinawatra's lobbyist Robert Amsterdam sitting in the front row of her organization's meetings, but she also collaborated with Freedom House upon whose board of directors sits another of Thaksin Shinawatra's lobbyists, Kenneth Adelman. 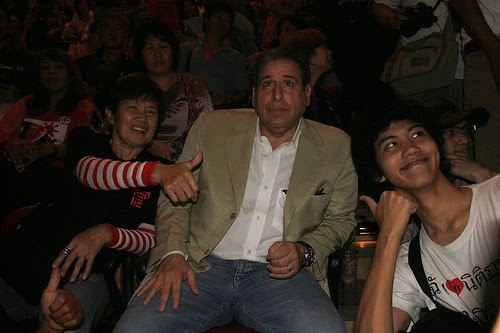 Adelman providedlobbying services for Shinawatra in 2007, shortly after the first coup aimed at toppling his political machine was executed. He did so as a lobbyist under Edelman PR (official DC lobbying registration here), and the organization he serves as a director of, Freedom House, has been regularly leveraged ever since to support Shinawatra's political machine and undermine his enemies. Sawatree would also serve as a "witness for the defense" in a criminal case targeting US-funded Prachatai director Chiranuch Premchaiporn. At every turn Sawatree finds herself the recipient of US funding and support, or mobilizing her academic facade on the behalf of others who are. While Sawatree and her Nitirat organization attempt to portray themselves as the keepers and arbiters of democracy and human rights in Thailand, their lack of transparency and their multiplying conflicts of interest render their message moot. They are a lobbying front dressed as academia, involved deeply with literal lobbyists registered as in the service of deposed dictator Thaksin Shinawatra. That they are working in tandem with these insidious interests undermine the very principles they are hiding their agenda behind. Eroding further both Sawatree and Pinkaew's "academic" facades is the fact that their donors and foreign collaborators are diametrically opposed in every way imaginable to the principles both women peddle their political agendas behind. Upon NED's board of directors we find John Bohn who traded petrochemicals, was an international banker for 13 years with Wells Fargo, and is currently serving as a principal for a global advisory and consulting firm, GlobalNet Partners, which assists foreign businesses by making their "entry into the complex China market easy." Surely Bohn's ability to manipulate China's political landscape through NED's various activities both inside of China and along its peripheries constitutes an alarming conflict of interest. However, it appears "conflict of interest" is a reoccurring theme throughout both NED and Freedom House. 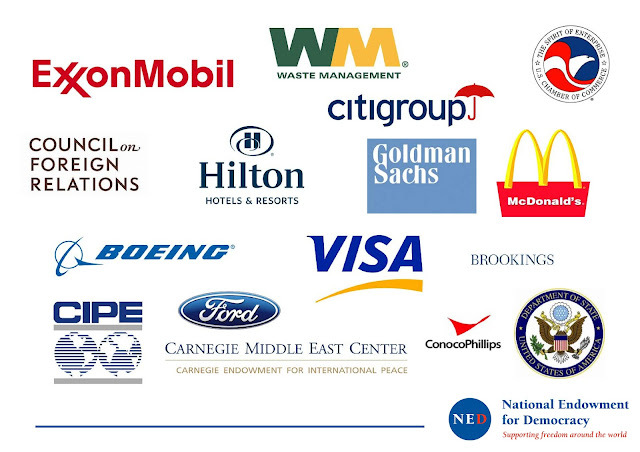 Freedom House, whom Sawatree collaborates with, is funded by a multitude of corporate-financier interests. These include Goldman Sachs, Facebook, Google, Yahoo, AT&T, and the Ford Motor Company - not exactly the names that come to mind when one things of "liberal democracy" or "progressive" politics. It is safe to say that neither NED nor Freedom House garner within their ranks characters appropriate for their alleged cause of "supporting freedom around the world." It is also safe to say that the principles of "democracy," "freedom," and "human rights" they allegedly champion for, are merely being leveraged to co-opt well meaning people across the world to carry out their own self-serving agenda. Finally, for those like Pinkaew and Sawatree that willingly collaborate with disingenuous financially motivated organizations like NED, Freedom House, USAID, Open Society and others, they at best undermine entirely their own cause and credibility, and at worst, constitute acts of outright treason. Those that claim it is "benign" associating with or accepting funds from NED, Freedom House, USAID and others among this network of corporate-financier directed neo-imperialism, are naive at best. Astonishingly, supporters of Pinkaew Laungaramsri and Sawatree Suksri have called in concert for those investigating the nature of their foreign funding to be sued in an attempt to silence such inquires. Pinkaew has refused to answer a series of questions posed to her in regards to her foreign funding, dismissing curiosity as "spinning hatred" toward her and her work. Sawatree's defenders, including Kan Yuenyong of the Siam Intelligence Unit warned this author to "please write [regarding Nitirat] carefully. This is my warning." Kan, like so many others, apply a double standard where they are free to demand answers, transparency, and accountability from others, but none may question them. Others still, are fond of defending the right to slander and even threaten Thailand's revered head of state, but work swiftly to silence critics who target them. On Facebook in particular, Shinawatra supporters who hide behind the gimmick of "rights" and "democracy" regularly target opposing points of view by abusing the terms of service to have comments deleted and accounts suspended. This is an exhibited mentality and practiced method used by pro-Western propagandists and the indoctrinated not only within the context of Thailand's political crisis, but wherever Western interests are prying beyond their borders. Not only for the sake of Thammasat or Chiang Mai University, but for Thai academia in general, politically motivated facades that are funded from abroad, clearly partial, and carried out by disingenuous, opaque collaborators abusing their academic credentials should be strictly prohibited on campus. Should the likes of Pinkaew Laungaramsri or Sawatree Suksri wish to engage in immense, compromising conflicts of interest, jeopardizing stability within their country on behalf of foreign interests, they should do so in their private time and beyond the boundaries of the their respective universities. Lobbyists should transparently identify themselves as such, rather than hiding behind otherwise noble professions, from human rights advocates to journalists, to professors and scholars. While university policy should prohibit lobbying on campus as a matter of policy, Thai law should demand that all academic groups, NGOs, and others receiving foreign funding and/or support clearly declare such support transparently, annually, and in all languages they conduct their activities in, particularly Thai and English. Speaking up about issues within one's country from whatever perspective is one's right. Taking cash from overseas while manipulating public perception and peddling a political agenda is treason.